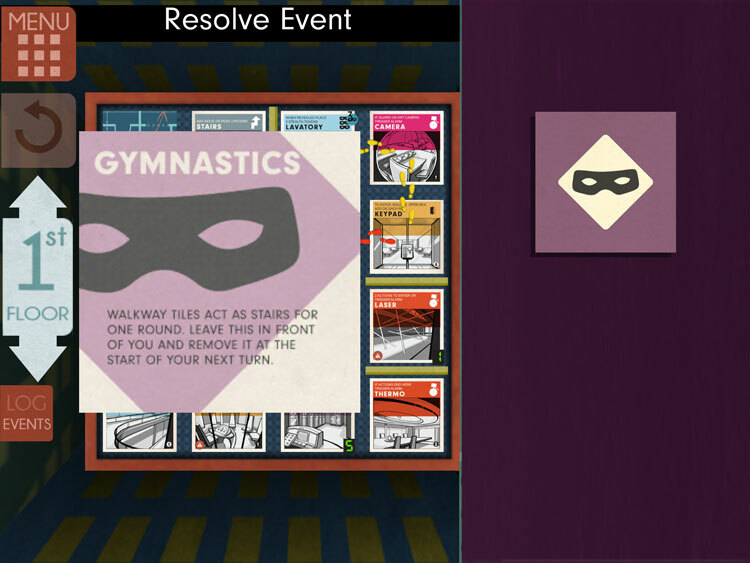 We review Burgle Bros for iOS, a cooperative board game where players are trying to steal loot from a bank vault. This great board game from Tim Fowlers finally makes its way to our iPad and iPhone and we talk about how well the translation worked. Game designer Tim Fowers is quietly putting out a nice catalog of games. The first game of his I played with the excellent deckbuilding/word game mashup Paperback, which is really the only word building game I need to own anymore. Burgle Bros, the second game of his I played, was a clever heist game that had players sneaking around a bank and cracking safes. Recently, this tabletop game has made its way out to our tablets and we are going to dive into the iOS version to see how it translates to the digital realm. Burgle Bros. is a cooperative heist game where players take on the role of bank robbers trying to stealthy steal that precious loot. Each round players are moving around a grid of cards, searching for the bank vault. Each floor card, when revealed, will have either good or bad (mostly bad in my opinion) game effects. At the end of a players turn, a guard will patrol around the floor, if he crosses your space, you lose a stealth token. If a player loses all their stealth tokens before they find and escape with the loot, then its game over. Players are moving around the grid of cards, searching for the codes to the vault. 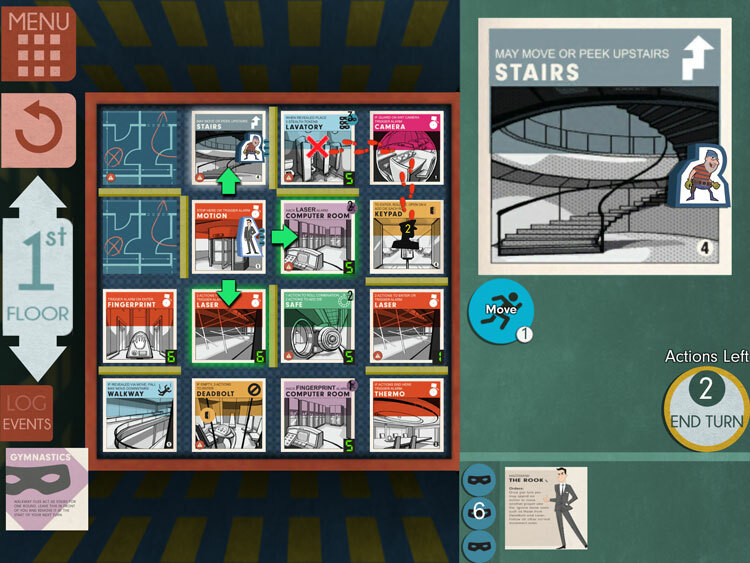 OK, maybe I’ve been spoiled by the amazing interfaces from Asmodee Digital and DigiDiced, but the look of Burgle Bros just doesn’t really excite me. Overall it’s fine, it works (mostly), but the in game interface feels really Spartan. This looks to be a straight up digital port of the analog game without much in the way of bells and whistles. Even some of the text on the event cards feels like it could have been higher resolution. On the plus side, the overall game play doesn’t really suffer because of that. The center of the screen houses the floor cards and taking actions is pretty easy. Simply tap a card and any options will present themselves on the right side of the screen (peek, move, etc). The best part about playing this game digitally is that it shows the movement of the guard. His movement for the turn will be shown in a series of red and yellow steps. The red markers helpfully show where he will move this turn, with the yellow being subsequent turns until he completes his patrol. One issue I had with the interface was that scrolling through items wasn’t very easy when you had more than a few. You have to scroll horizontally through a list of small cards. An inventory popup screen would have worked much better. If you only take 2 of your 4 actions in a turn, an event card is drawn. Beating the game with a character will unlock an alternate version. I was also pleased to see that the game includes an undo button, something I consider a must have for almost all iOS game translations. It’s just too easy to make a mistouch on these small screens. It is also intelligent enough to be disabled when you make a move that reveals hidden information (such as revealing a new room), otherwise it would essentially turn into a cheat button. One design decision I really appreciated was the ability to customize the game. You can choose between 6 different building setups (different floors and sizes) and also enable a host of variable options such as hiding the guards or spawning events every round. And once you beat the game with a character, you unlock an alternate version of them, complete with their own special power. Unfortunately Burgle Bros. only includes one mode of play, offline. There is no AI to speak of, so you control all characters. The bigger miss is the lack of any kind of multiplayer (other than passing the device around). The ability to play online with friends would be a welcome addition to the game. The goal of the game is to break into the safe on each floor and escape with the loot. 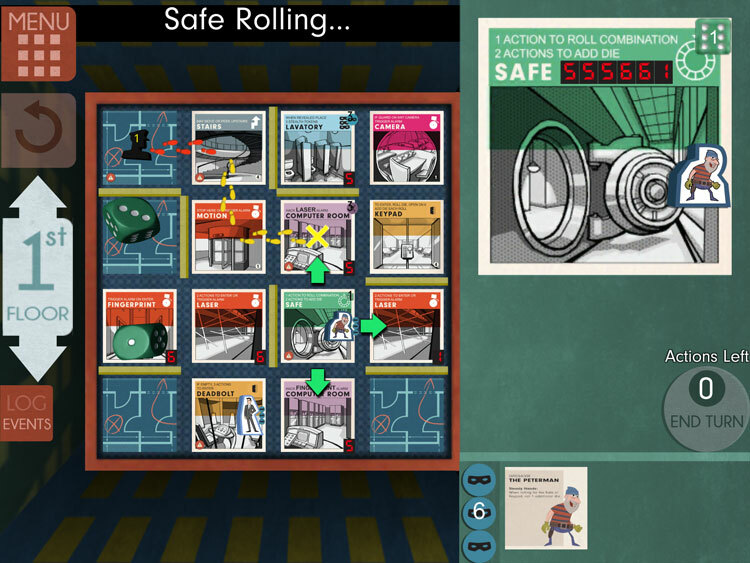 If you are a fan of the tabletop version of Burgle Bros, then you can’t go wrong picking up this app. Burgle Bros is a bit of a table hog, so this is a great way to play the game, especially while on the go. If you’ve never played it before, it’s a unique and difficult cooperative game that will entertain you for quite a while as you try out each of the unique characters. 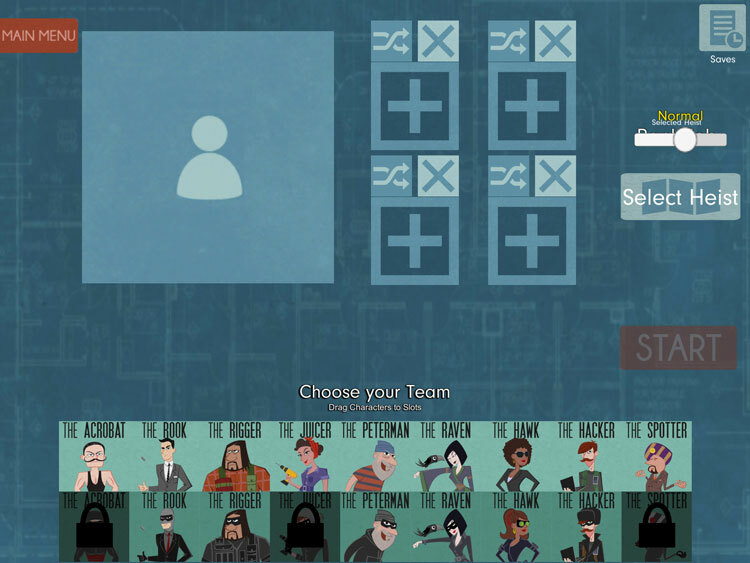 While the interface in Burgle Bros feels a bit lackluster at times (especially the end game victory screen), that didn’t really stop us from enjoying the game. The real miss here is the lack of online multiplayer. Fortunately, all of that could be fixed in a future update. For now, you can easily get in a game of Burgle Bros in the time it would probably take you to setup and teach the tabletop version. Final Score: 4 Stars – A solid port of a great tabletop game to our tablets. While it could stand a little bit more polish, it’s a good way to get in a quick game.